Home » Personal Finance » How to Generate Residual or Passive Income? In today without income it is very difficult to live for anyone, thus Income is important part of our life. We do various things in order to generate income like job, business etc. But do you know types of incomes and which one is best? Let us discuss the same. Earned income or Linear income is any income that is generated by working. More than 90% of people around the world are accustomed to the source of income known as Linear Income or Earned Income. Your salary or money made from employment is considered earned income. While earned income is the most common mechanism for making money, it’s obvious downside is that once you stop working, you stop making money. Additionally, because the amount of money that is made through earned income is directly proportional to the time and effort you spend working, it’s difficult for someone to make more earned income without either learning a new (or more valuable) skill or working longer hours. Additionally, earned income is taxed at a higher rate than any other type of income. Earned Income or Linear Income requires continued work. One huge benefit of earned income over the other income types is that you generally don’t need any startup capital in order to make earned income, which explains why most people rely on earned income from the start of their working life. Once we generate income we make investment, these investments put together is known as portfolio. Income generated by this investment is known as portfolio investment. Income generated by buying selling stocks, mutual funds, real estate or other assets falls in this category. 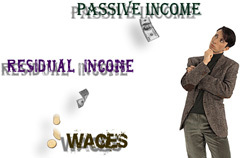 Residual Income or passive income is different. It is the most powerful and profitable source of income. Residual Income or passive income is the income of the rich. It is a source of income that keeps coming in on a regular basis, from work you do once – meaning even when you are not working. Residual Income is not about “get rich quick” – the principal very much misunderstood by many people. It requires effort, determination, especially in the beginning… and some time for the magic to start working. There is nothing wrong with having a Linear Income. It is considered to be an honourable form of earning a living. Some people can earn good money. Hourly wages can run from a few rupees to thousands of rupees. However, Linear Income is limited to the number of hours worked and only provides an income when you work. In other words, when you stop work, it stops. 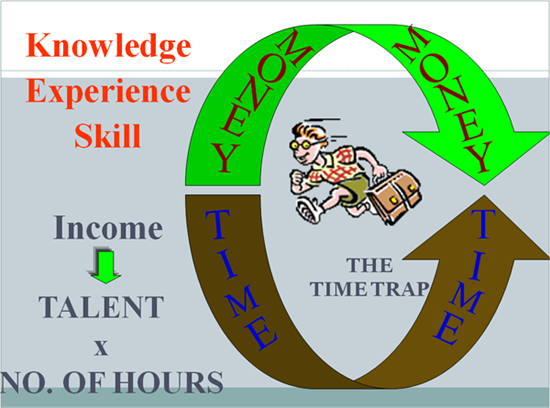 More and more people are turning to something called time leveraging to create long term Residual Income. With time leveraging, there is no hourly limit placed on your worth and money continues to come to you whether you work or not. The difference between Linear Income and Residual Income is that with Residual Income, your productive time is leveraged. That is, your time spent at work becomes increasingly worth more and more. Unlike fixed-salary employment, leveraged income has no upper limit. Creating and Selling Intellectual Property — Books, Patents, Song writing, Internet Content. This type of income is also known as royalty income. You earn interest on your savings account or certificate of deposit at your bank. That’s as long as you keep the money in the bank. Real estate is proven way to earn good income but it requires special expertise and a great deal of money nowadays. You need to be a real estate owner to earn Residual Income through rent. Earned income is Good Income, Portfolio income is better income but believe me residual income is best income. I can say it is the best retirement insurance and the only method for most people. If you agree with me start building residual or passive income now.